Thank you to Good to Know & Unilever Spreads for sponsoring this post. I was selected for this opportunity as a member of Clever Girls Collective. I have to admit, Thanksgiving just might be my favorite holiday. It might even pass Christmas (maybe). For me, the day is all about spending time with loved ones, giving thanks, traditions and food. Lots of food. In my family a lot of our traditions are focused around food, like this delicious Yam Casserole with Toasted Marshmallows. It’s my grandma’s recipe and it is part of our Thanksgiving menu each year. Even when I spend the holiday with my in-laws, I make this casserole because a Thanksgiving just isn’t the same without it! 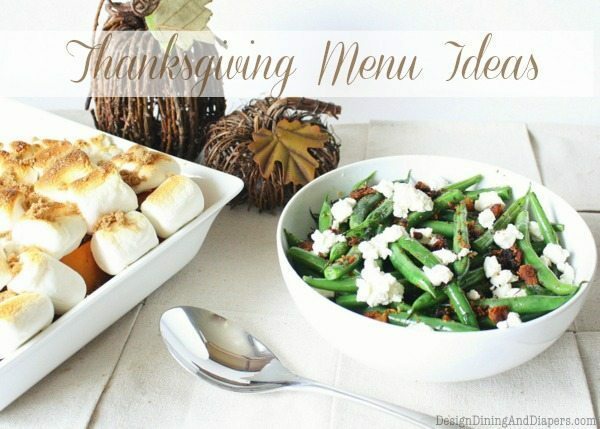 Today, I’m sharing two Thanksgiving side dishes that would make great additions to your Thanksgiving menu. A Yam Casserole with Toasted Marshmallows and Green Beans with Pancetta and Goat Cheese. 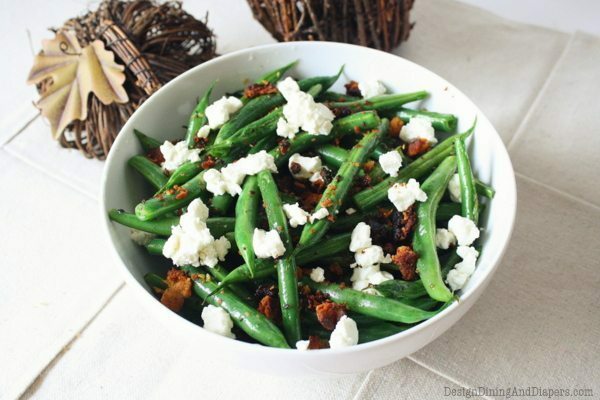 Green beans sauteed in I can't Believe It's Not Butter combined with crisp pancetta bites and melted goat cheese. Wash and prepare the green beans and place them in a large pan on medium-high heat. Place 2 Tablespoons of I Can't Believe It's Not Butter into the pan and saute the beans until tender. Remove from heat. In a separate pan, place the 5 slices of pancetta and cook until crispy. Using a spatula, remove the pancetta from the pan and place it into a paper towel to absorb the excess oil. Once the pancetta has cooled, crumble it into smaller pieces. 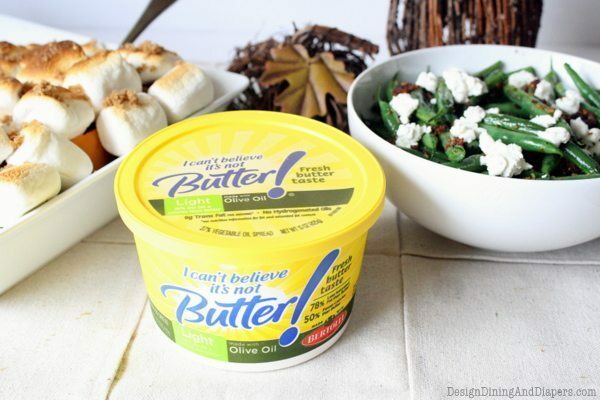 Mix with the green beans and stir in goat cheese crumbles. Sweet yams boiled in sugar water and smothered in brown sugar, I Can't Believe It's Not Butter and Marshmallows. Wash and peel the yams and cut them into quarters. Place them in a large pot and cover with water and ½ sugar. Boil until tender (about 30 minutes). Drain sweet potatoes and place them in a 11X14 oven safe pan. Sprinkle ½ cup of brown sugar and place ½ cup of I Can't Believe It's Not Butter (cubed) evenly over the potatoes. Cover with mini or large marshmallows. 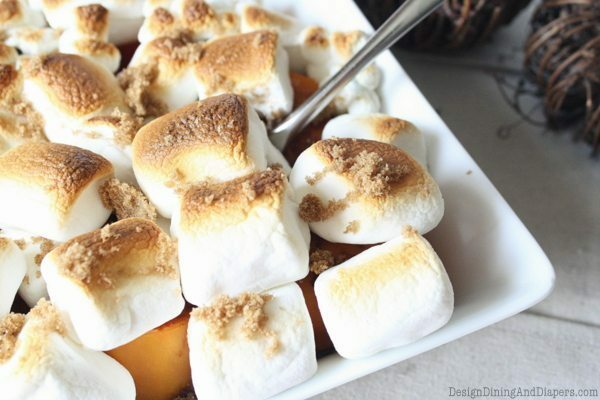 Place the oven on broil and place the dish in the oven for 2-3 minutes or until the marshmallows begin to brown. Sprinkle with additional brown sugar on top and serve. Loving the green beans recipe!! I am working on what I will be making at Thanksgiving and am thinking this might be added to the list. Those green beans just went on my must make list. I don’t host Thanksgiving but, if I can’t convince my mom to add them to our menu for that holiday, they will definitely make an appearance at Christmas. Thanks for sharing! I love your recipes and I need all the help I can get in the kitchen! Especially since my mother-in-law may be coming for Thanksgiving! My mouth is watering! What great recipes! Thanks for linking up! I featured your post in my wrap up http://tidymom.net/2012/creative-thanksgiving/ Have a great weekend!